The following bulletin was obtained from the public website of a local security association. 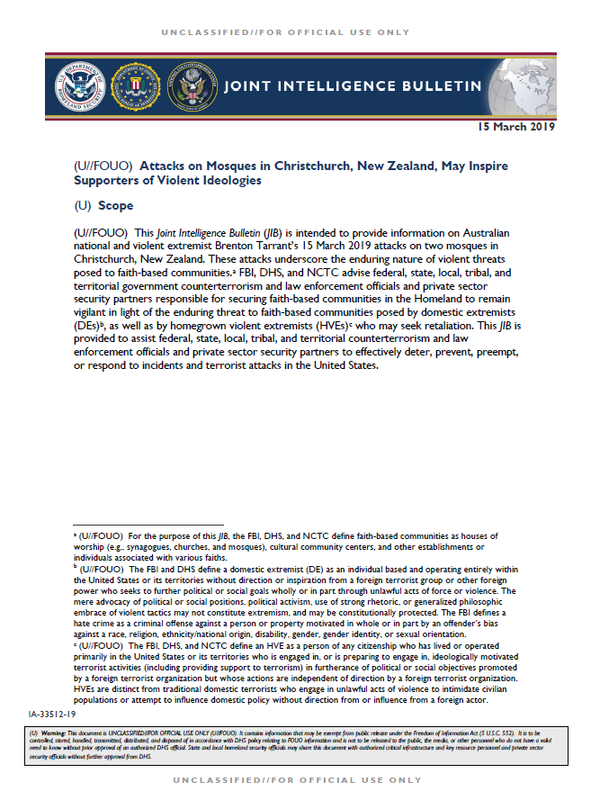 (U//FOUO) This Joint Intelligence Bulletin (JIB) is intended to provide information on Australian national and violent extremist Brenton Tarrant’s 15 March 2019 attacks on two mosques in Christchurch, New Zealand. These attacks underscore the enduring nature of violent threats posed to faith-based communities. FBI, DHS, and NCTC advise federal, state, local, tribal, and territorial government counterterrorism and law enforcement officials and private sector security partners responsible for securing faith-based communities in the Homeland to remain vigilant in light of the enduring threat to faith-based communities posed by domestic extremists (DEs), as well as by homegrown violent extremists (HVEs) who may seek retaliation. This JIB is provided to assist federal, state, local, tribal, and territorial counterterrorism and law enforcement officials and private sector security partners to effectively deter, prevent, preempt, or respond to incidents and terrorist attacks in the United States.